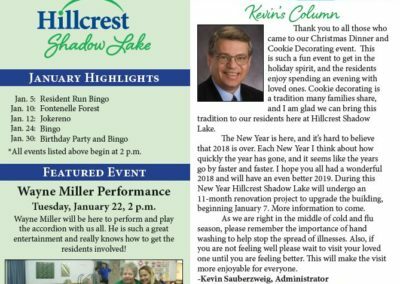 The well-established team at Hillcrest Shadow Lake has a history of enhancing lives for many years under the former Huntington Park Care Center. With its integration into the Hillcrest family of services in July 2016, you can expect compassionate care for your loved one that meets Hillcrest’s high standards of excellence. Our team members form real and meaningful connections with residents. Your loved one will have the support of a team that feels like family. Each resident receives personalized 24-hour care delivery, including bathing, dressing, grooming, assistance with mobility, transferring, medication administration and other help as needed. Our Registered Dietitian ensures proper nutrition as directed by your loved one’s care plan. Amenities include private or companion rooms with a bathroom, hair salon, private family dining room and an open dining room that promotes social connections. 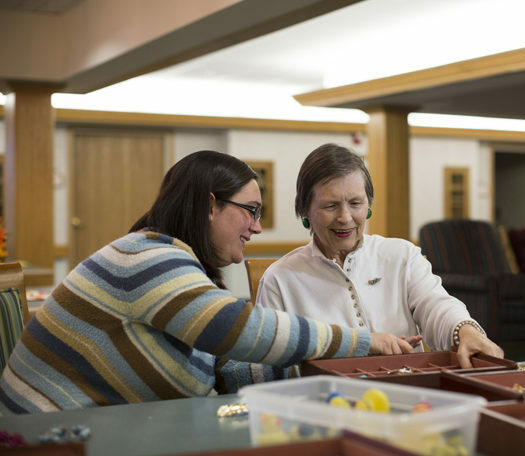 Our therapeutic recreation program keeps residents active and engaged to the level of their ability. We take the time to learn your loved one’s preferences, and offer comfort and entertainment tailored to their interests. Our building will undergo renovations in Fall 2018 to modernize the infrastructure and enhance resident and family comfort. Hillcrest Shadow Lake is conveniently located in Papillion near shopping, churches and CHI Midlands Hospital. We accept Medicaid upon admission as well as private pay and long-term care insurance. To learn more about services, eligibility, financial arrangements or to schedule your visit, call us today at (402) 339-6010.